James Barr Ames was born June 22, 1846, in Boston. He achieved prominence as an educator and concentrated his career efforts at Harvard. A graduate of Harvard College in 1868, Ames earned a master of arts degree in 1871 and attended Harvard Law School in 1872. He received several doctor of laws degrees from various universities, including the University of Pennsylvania in 1899, Northwestern University in 1903, and Harvard in 1904. In 1868, Ames began his teaching career as an instructor for a private school in Boston. Three years later he began his professional association with Harvard, acting as a tutor in French and German until 1872 and continuing as an instructor in medieval history for the next year. From 1873 to 1877 he was an associate professor of law; in 1877, he became a professor of law. 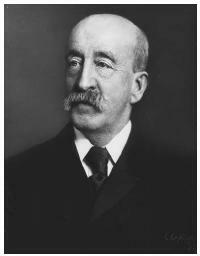 From 1895 to 1910 he performed the duties of dean of the law school. In 1897, he participated in the establishment of the Harvard Law Review. Ames distinguished himself as a teacher of law by utilizing the Case Method introduced by legal educator and former Harvard Dean Christopher Columbus Langdell. Langdell's approach presented principles of law in relation to actual cases to which they were applied. By studying the cases, a student of law was given an accurate example of the law at work. "An immortal right to bring an eternally prohibited action is a metaphysical subtlety that the present writer cannot pretend to understand." Ames extended his talents to the field of legal literature. He is the author of Lectures on Legal History, which was published in 1913. He died January 8, 1910, in Wilton, New Hampshire.